Leaves are starting to fall, the high school's marching band is practicing, and the evening air is crisp. It must be Bratwurst season. I was tempted to start this blog with an ingredients list from a popular brand of store-bought Brats. Why spoil all the fun? You know what's in 'em; I know what's in 'em. Instead, let me share a quick and easy way to make them yourself! A true wurst (sausage) has a casing. That is a lot of work, and I'd have to peel it right off again for the kids. 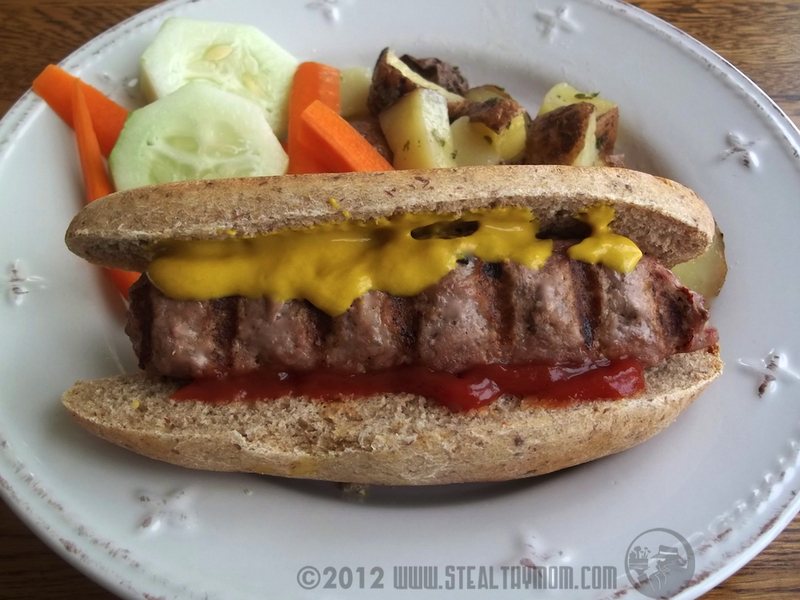 This is Not Wurst: a homemade brat without the casing, using ground pork from a small, local farm. Factory farm pork from the grocery store might not work. salt. 1 tsp will yield 200mg apiece of sodium, 100mg each for 'lite' salt. I skip it altogether to leave "room" for mustard and ketchup. Thaw the ground pork, and work in the seasonings. Divide into a dozen balls. Chill for an hour if you have time. Roll the meatballs into a sausage shape. Grill just like you would a regular Bratwurst. For the first turning, a metal spatula is useful to avoid breakage. I shared this post with Foodie Friends Friday at Walking on Sunshine, Fight Back Friday, the Ultimate Recipe Swap, Foodie Friday, Monday Mania, Make Your Own Monday, Fat Tuesday, Full Plate Thursday, Simple Lives Thursday, Real Food Wednesday and Frugal Days, Sustainable Ways. This looks GREAT! Thanks for sharing on Foodie Friends Friday! Please come back on Sunday to VOTE! Really... thats all I have to do. My daughter hates casing... this is brilliant. Thanks for sharing it on foodie friday. Great idea, I love making my own sausage too, but I usually do patties - love the idea of rolling it into more of a sausage shape! This is a great recipe that we will really enjoy! Hope you are having a great weekend and thank you so much for sharing with Full Plate Thursday.